ATLANTA — The Braves wanted starter Julio Teheran to finish the eighth inning and allow manager Fredi Gonzalez to bring in closer Jason Grilli to start the ninth and finish the game. "They got the first three guys on and scored three runs without putting the ball in play," Gonzalez said. "We kind of shot ourselves in the foot there." Teheran's day ended as it began — in frustration. 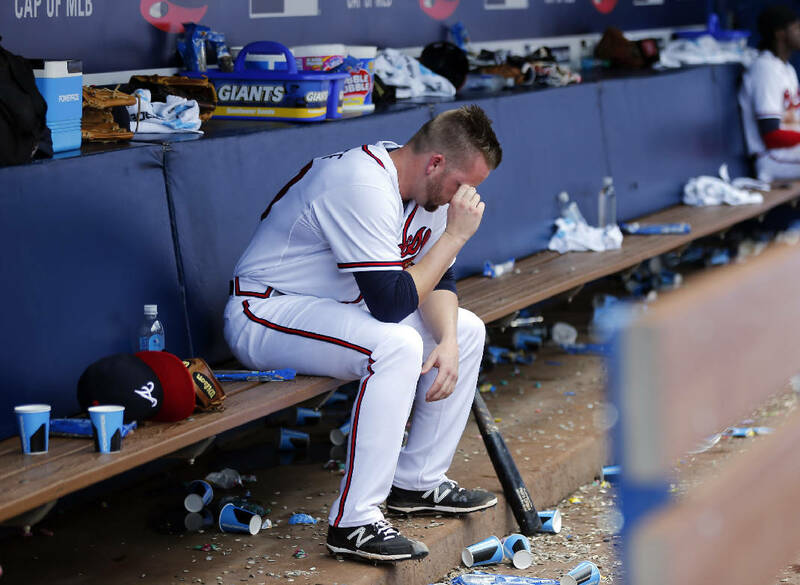 Atlanta wasted a three-run lead and lost 6-4 in 11 innings to the San Diego Padres on Thursday. Yangervis Solarte hit a two-run single in the 11th inning off Brandon Cunniff, the seventh Atlanta pitcher, as the Padres overcame a benches-clearing incident and the ejection of manager Bud Black. The game lasted 3 hours, 42 minutes and started nearly an hour late because of rain. Players left the dugouts in the first after Teheran hit Matt Kemp with a 90 mph fastball. No punches were thrown and no one was ejected. Black was tossed in the seventh for arguing with umpires Jordan Baker and Jerry Meals. Craig Kimbrel, facing his former team for the second time in the series, earned his 15th save in 16 chances with a perfect 11th that included Andrelton Simmons' groundout and strikeouts by Christian Bethancourt and pinch-hitter Jonny Gomes. "We've been playing really good baseball in extra innings, and that just shows how good of a team we have," Kemp said. "We have to win those games. That was a good comeback." Atlanta's struggling bullpen, which began the day with a major league-worst 4.75 ERA, combined with Bethancourt to let San Diego score three runs in the eighth. After a walk loaded the bases with no outs and chased Teheran, Bethancourt's passed ball allowed Solarte, who entered as a pinch-hitter, to score and cut the deficit to 4-2. Luis Avilan walked Yonder Alonso, forcing in a run. David Aardsman struck out two batters, but Wil Myers scored the tying run when Bethancourt was called for catcher's interference against Cory Spangenberg. "That was the whole game, really," Gonzalez said. "We go out there, get 1-2-3 and hand the ball to Grilli. We don't blow up the bullpen and we've got a chance to win the series and have a winning home stand. That didn't happen." Cunniff (2-2) walked Derek Norris to open the 11th and allowed Spangenberg's infield single. One out later, Alexi Amarista loaded the bases with a single and Solarte followed with the go-ahead hit. Dale Thayer (2-0) allowed a hit and a walk in the 10th. Baker threw Black out of the game after the Braves went ahead 3-1 on an infield single by Jace Peterson, who made a pair of sharp defensive plays at second base and is hitting .381 in 21 at-bats since receiving a cortisone shot June 4. Black approached plate umpire Jordan Baker to argue the ball hit Peterson's bat twice before rolling down the first-base line, allowing Simmons to score from third. Black asked crew chief Jerry Meals to have the umpires convene, but Meals refused. Visibly angry, Black was soon ejected by Baker. Cameron Maybin followed with a sacrifice fly that gave the Braves a 4-1 lead and chased starter Andrew Cashner. Freddie Freeman drove in Atlanta's first two runs. His RBI double in the first tied the score at 1-1; in the sixth, his 11th homer of the season made it 2-1. "They're a tough ballclub, but we had an opportunity to win that series today," Freeman said. "It's a little frustrating. We did split, but you always want to get more." Cashner gave up four runs, seven hits and four walks in 6 2/3 innings. Teheran allowed four runs — three earned — four hits and three walks in seven-plus innings. He said he wasn't trying to hit Kemp, who went 2 for 14 with an RBI in the series. "You don't want nobody to get hit like he was, especially with two strikes," Teheran said. "I was trying to throw the same pitch that I threw before and he was swinging. He got upset, but it's part of the game." Atlanta left-hander Alex Wood (4-3, 4.09) returns to the mound today for his first start since being ejected in Sunday's 3-0 loss to Pittsburgh.